These sweet scented flowers are as lovely in a painting as they are in the garden. 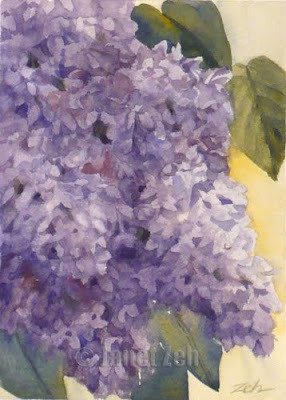 Just the thought of lilacs blooming is a treat! In this painting they can bloom for you year round. This watercolor painting is done using my latest technique. In this technique, I use a limited palette of one red, one blue and one yellow. The colors you see here are a mixture of those three colors. This makes for a fresh and colorful watercolor that is still subtle enough to blend with any decor. All the paintings done this way will work well together as they all use the same base colors.